From cracked and aging, to smooth and new! 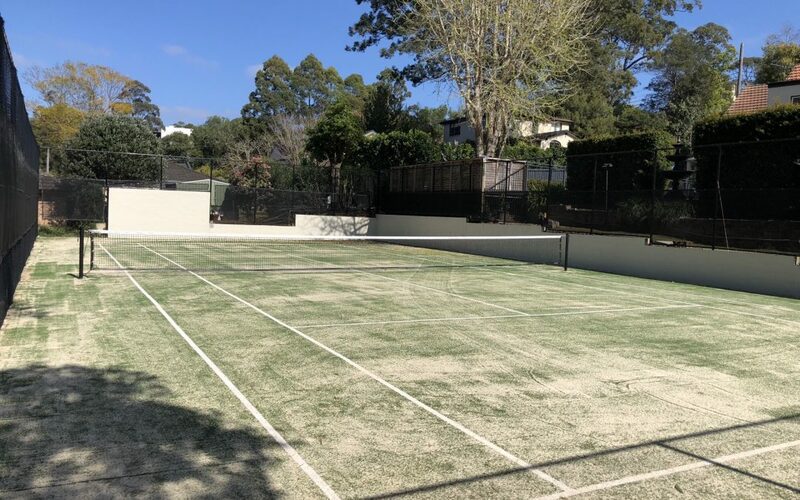 The family of this residence in Pymble, Sydney can now GET ACTIVE on their newly refurbished tennis court. The Dynamic Sports Facilities team were called into the restore this backyard tennis court which had fallen into disrepair. 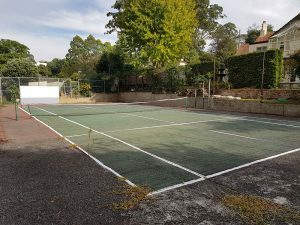 When the new owners bought the residence they decided to renovate the house and compliment that with a renovation of the existing tennis court as well. The old asphalt court was very run down with large cracks and lots of trip hazards. The fencing was also in need of a face-lift. The old court was in need of repair. The Dynamic Sports Facilities team kicked off this project by demolishing the existing fence. Everything for the job needed to be brought in by hand due to the difficult site access and narrow steps leading to the court. To even out the court and create a level playing surface, a slurry coat was applied to obtain a uniform surface. Over this the team installed ‘Pro Tennis’ (19mm) sand filled synthetic grass tennis surface, ideal for player comfort and performance. A shiny new black 3.6m fence was installed around the court, with the addition of gates. A new set of tennis nets and posts completed the project. The family now have an up to date and modern tennis court that will bring them many years of sporting fun. This tennis court is just one of the many projects Dynamic Sports Facilities has completed for residential purposes. We also design, construct and restore cricket wickets, golf tees and greens, basketball courts, and hot shots tennis courts. Do you have a sport loving family? We can also create multi-sport courts with a combination of line markings and equipment so you’re not limited to just one sport. Do you have a spot where grass just won’t grow? We also install synthetic lawns, making mowing a thing of the past! Need help with a residential project? Contact our team for an obligation free quote. We can do a site inspection and assess your requirements and provide recommendations.